Coral fragging, otherwise known as propagation, is the act of taking an established coral colony and cutting or breaking it into smaller colonies (called daughter colonies) and securing them to an artificial substrate or directly to the natural reef. The practice was first developed in the 1950’s for used in the aquarium trade, which is an efficient way to create new colonies of coral for sale using corals that have already proven to be well adapted to growing in tanks. This practice has the benefit of allowing sellers to produce a feedstock which does not require further collection from wild populations and has been very successful. Subsequently, the same practice has been adopted in the field of reef restoration for wild populations, with little consideration for the genetic affects it has on wild populations of corals. This article is only focused on the later situation, as fragging for the aquarium trade is seen as an entirely positive action. In the early 90’s this technique was tested for use in coral restoration, and in the last decade more and more programs around the world have risen using the technique of fragging, in so called coral conservation programs. One only needs to google the term ‘coral restoration’ to see the abundance of programs claiming great success for creating thousands to hundreds of thousands of ‘new corals.’ However, you will be hard-pressed to find any articles or scientific papers that detail the fate of those corals after more than 1 year. Breaking corals and creating new fragments is easy. It looks good in pictures and sounds nice on social media and press releases. An uninformed person sees this and is impressed, and these groups are able to secure further funding and increase the size of their projects, without ever detailing the fate of the fragments they created or the long-term effects of these techniques on reef health. Indeed, few ever even mention any genetic implications of their efforts. When reviewing these programs, most are run by people with little to no scientific background, and rarely do they have monitoring programs in place to understand the long-term survival rates of the restored reefs. This is becoming a growing problem on reefs all over the world, and urgently needs to be addressed. To understand what is wrong with fragging, we first must understand the genetic implications of these actions. Corals are a colony of polyps that are created through asexual reproduction, meaning that each individual in the colony is a clone of the original polyp that was produced through sexual reproduction. Thus, corals have two reproductive modes. The asexual mode allows corals to increase in size and repair lost or damaged tissue through the creation of new polyps, and in some cases the creation of daughter colonies through fragmentation. 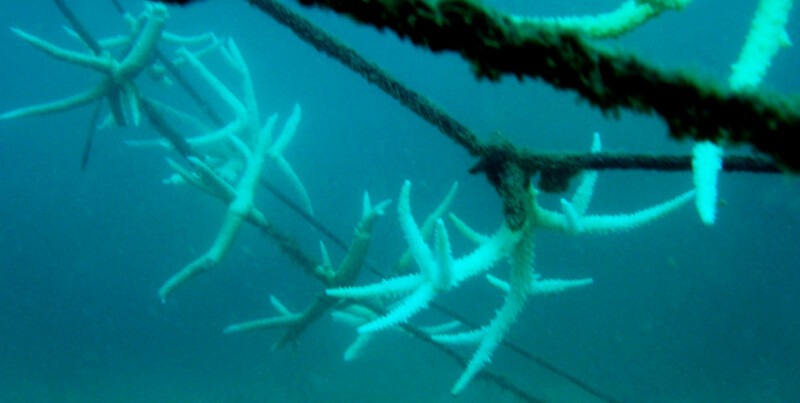 Corals which break easily, such as branching, bushy, or plate-like growth forms, have a high propensity to fragment naturally due to storms, fish activity, or other means of mechanical breakage. Some of the fragments created through these processes survive, and create daughter colonies, increasing the rage of that particular coral’s growth. Other corals, such as massive corals, or coral bommies, are less likely to reproduce through this mode due to their geometry and skeletal density. The asexual reproductive cycle is thus implied in the spread and growth of reefs, however, except in special cases (such as stands of Acropora), is a minimal factor in the abundance of corals on the reef. Restoration programs that focus on the asexual reproductive mode of reef expansion are thus increasing the number of corals on the reefs by mimicking this process, but they are creating reefs with very little species and genetic diversity. Often in such programs, only the most easily propagated, or fastest growing corals are used in order to show high success, without considering the functional or structural importance of the species being used. This fact is extremely important when we think about the long-term survival and resilience of reefs, especially in the face of increasing anthropogenic threats, ocean acidification, and climate change. Setting aside the issue of using already established coral colonies as ‘donors’ for these projects, there are many other crucial problems that are created through this practice, and they all relate to the coral’s ability to survive, adapt, and evolve. These three abilities are a factor of diversity, both on a species level and a genetic one. The resilience of a reef, or its ability to withstand and recover from disturbances is partly a factor of the abundance of corals, but more significantly the diversity of the corals on the reef. Different species of corals are more or less adapted to survive in the face of different threats such as sedimentation, disease, temperature, or changes in water quality. So, the greater the diversity of corals on the reef, the better prepared that reef is to handle both small scale and large-scale disturbances. Furthermore, at a species level, survival is based on the genetic diversity within populations as different individuals are more or less genetically fit to deal with various stresses. Take humans for example, when a disease such as the influenza virus is introduced into the population, each individual is going to be more or less susceptible to developing an infection. This will be a factor of the environmental and physical differences between individuals (i.e. stresses to the immune system, overall health, comorbidities, etc. ), but it will also be a function of the individual’s genetic fitness. As we are all unique on a genetic level, we will also have different susceptibilities to the infection, some better prepared then others to deal with it. This allows our populations to survive events like the Spanish Flu epidemic of the early 20th century even though many individuals perished. Now, imagine that all of us were clones of one another. When such disease epidemics are introduced into the population, every individual is just as susceptible to mortality and the disease easily spreads through the population and causes extirpation of that group. There have been few in-depth studies on the effects of decreased genetic diversity of reefs due to coral propagation (notably those by Baums 2008, or Shearer et al. 2009), but terrestrial examples show that the resilience of ecosystems to parasites, diseases, and other disturbances is reduced due to the effects of monoculture, cloning, and age uniformity. Coral restoration and conservation programs that rely on coral propagation to create feedstocks do not understand the genetic implications of their work. They are reducing the overall diversity of corals on restored reefs leading to what are known as Allee effects, genetic bottlenecking, inbreeding depressions, and reproductive failures. The overall concern implicated in these factors is a reduced ability for corals to survive disturbances and adapt to changing conditions. As corals are cloned to create new colonies that are then transplanted amongst the natural populations, they restrict the genetic diversity of that population. Allee effects are when certain genetic traits, which may be negative, become overabundant in the population and thus reduce its overall fitness. These effects were thoroughly described in a 2008 review by Iliana Baums, A Restoration Genetics Guide to Coral Conservation, which stated that by not taking into account the reduced genetic diversity of such gardened reefs, managers will most likely only improve conditions on the short term, while almost certainty decreasing the long-term resilience and adaptability of the reefs. In order for coral species to survive the next few centuries, they will need to adapt to changing climates and habitat conditions through evolutionary mechanisms of mutation and hybridization. Such mechanisms arise through attrition and reproductive success only achievable in the presence of high genetic diversity amongst populations. How do reefs normally recover and adapt? As explained above, the asexual reproductive cycle plays little to no role in the recovery and adaptability of reefs, also known as reef resilience. This is entirely dependent upon the sexual reproduction of corals. Sexual reproduction allows for new generations of individual corals that are genetically unique and have different degrees of fitness. This process also allows for adaptation through hybridization (as pioneered by the work of Bette Willis and others) which can lead to new species or sub-species of corals which are more fit than either of their parents populations. The larvae produced by parent populations are spread to seed degraded reefs with potentially better adapted corals, and that is the only way that corals will survive the effects of human disturbances and climate change. When monotypic stands of corals are created through propagation, those corals are likely to be the last generation in that area. First, asynchronous broadcasting corals have a barrier against ‘selfing’, meaning that the gametes (eggs and sperm) from a single coral colony cannot self-fertilize. 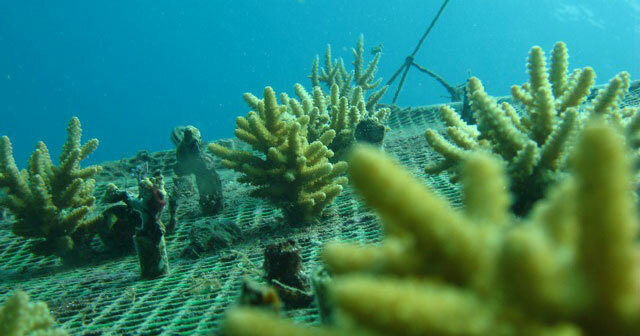 As discussed by both Baums (2008) and Knowlton (2001), if a reef is composed of mono-specific stands of corals due to large fragging projects than the result is an essentially sterile population that leads to reproductive failure, and no further generations of corals on the reef to replace those that are lost. This is not a small problem; this is a critical externality of current mainstream restoration projects that must end immediately. Programs such as those operating throughout the Indo-Pacific and Caribbean are well intentioned, but misguided and lacking in the basic scientific understandings of reef resilience and adaptability. The programs are reducing the reef’s ability to adapt and evolve to the changing conditions being experienced around the globe, and need to be ended before they go too far. Coral restoration programs should stop focusing on fragging or propagation techniques to produce feedstocks of corals. Instead they should utilize naturally created fragments from a variety of species already found on the reef, also known as ‘corals of opportunity’. By utilizing these naturally produced fragments, the programs are not increasing the genetic diversity, but are preserving it while increasing the abundance of corals without leading to the negative genetic effects discussed earlier (genetic bottle necking, inbreeding depressions, etc.). In order to increase the genetic diversity and adaptability, the only current method is through larval culturing and selective breeding techniques, which should be considered the gold standard of coral restoration going into the future. • All restoration programs should include long-term monitoring. Programs should never be judged to achieve success purely on the number of fragments they are able to create, and actually this should be seen by the scientific and conservation community as a problem, not a positive action. • Restoration programs need to be holistic in nature. Those doing only propagation and coral gardening will fail in the long-term. Only by encompassing a variety of passive and active techniques (i.e. monitoring and research, coral predator removal, nurseries for other keystone species, clean-ups, regulations, waste water management, increasing stakeholder capacities, etc.) can any program be successful in preserving or enriching the coral ecosystem. • Restoration programs which are community based or involve citizen science (ie dive centers) should understand the limitations to their skills and abilities, and focus on issues which they are qualified for. For non-scientists, this includes activities such as clean-ups, education, awareness, etc. • Programs which offer short certification programs (i.e. 1 to 3 days) for non-scientists should be limited by the rules of most SCUBA Diving organizations (i.e. PADI, SSI, BSAC, etc.) or NGOs such as Greenfins, which all state that divers should not touch any living animals under the sea, including corals. • Programs led by trained individuals, or those with a scientific background, should only use so called ‘corals of opportunity’ and strive to develop and implement coral spawning and larval culturing programs as the new standard in reef restoration. Baums, I.B., 2008. A restoration genetics guide for coral reef conservation. Molecular ecology, 17(12), pp.2796-2811. Clark, S. and Edwards, A.J., 1995. Coral transplantation as an aid to reef rehabilitation: evaluation of a case study in the Maldive Islands. Coral reefs, 14(4), pp.201-213. Knowlton, N., 2001. The future of coral reefs. Proceedings of the National Academy of Sciences, 98(10), pp.5419-5425. Shearer, T.L., Porto, I. and Zubillaga, A.L., 2009. Restoration of coral populations in light of genetic diversity estimates. Coral Reefs, 28(3), pp.727-733.